From testing to removing carpets and insulation, here's what it takes to rid a home of the toxic chemicals left behind after someone has cooked meth in a home. 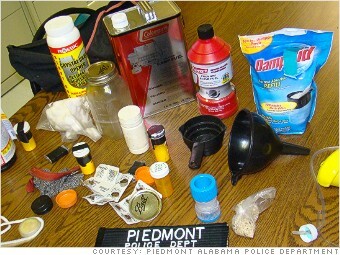 An evidence photo taken by the Piedmont, Ala., police department shows some of the ingredients used to cook up a batch of meth. Making crystal meth involves a witch's brew of ordinary household products like acetone, acids, brake cleaner and iodine, which are all used to cook cold medicine containing pseudoephedrine into meth. Bottles of paint thinner, drain opener or muriatic or other acids are strong indicators that someone has been making meth, as are propane tanks or other heat sources used to cook the drug. Sinks stained red by phosphorus, chemical smells and powdery residues left in glass cookware are also telltale signs.